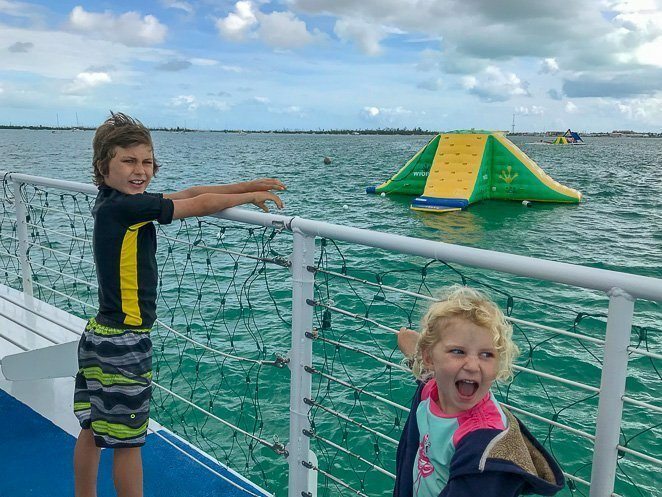 If you are taking a Florida Keys family vacation, then check out our ultimate list of 35 things to do in Key West with kids. 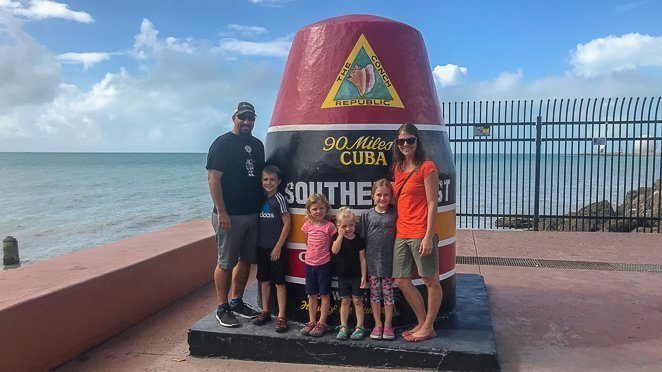 Our family of 6 enjoyed spending several days on this friendly and laid back island seeking out the best Key West beaches, great places to eat, and family friendly experiences. 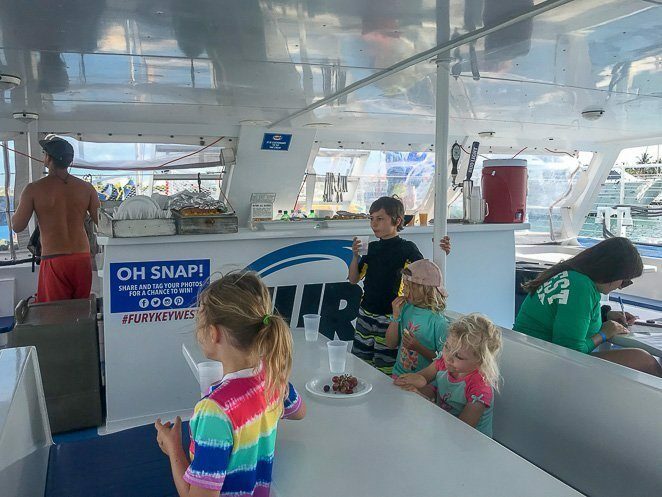 Book a full day excursion packed with a ton of experiences and fun with Fury Key West. 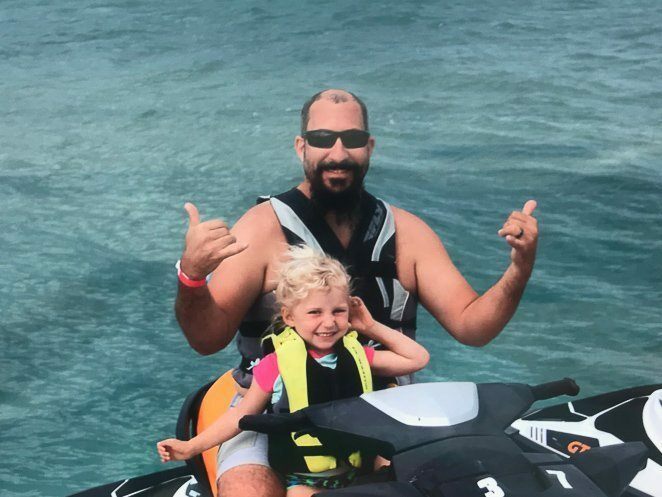 Our family of 6 booked our first big water sports excursion while we were in Key West where we went jet skiing, parasailing, snorkeling and swimming out in the turquoise-blue ocean off the coast of Key West. The 6-hour experience was just the right amount of time. Fury provided breakfast, lunch, snacks, and all you can drink juice and soda to keep everyone happy. I also appreciated that there were 2 bathrooms on board. 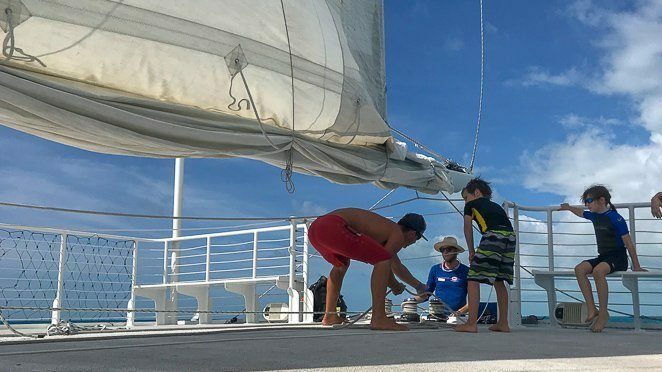 The crew with Fury was so great with our kids, letting them open the sails, helping them on and off the jet skies, and just making them feel like close friends during our entire trip. 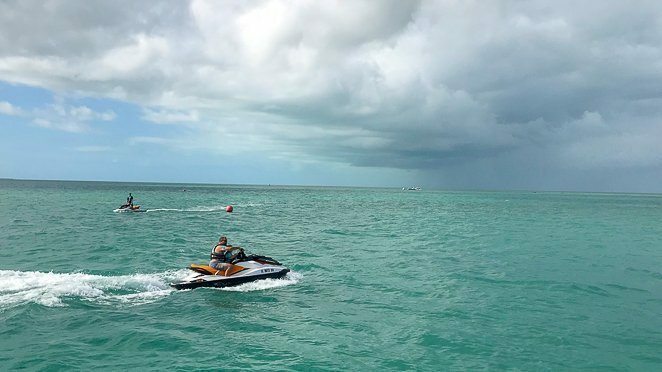 If you go out on the Ultimate Adventure with Fury Key West, jet skiing is included. I think this was by far our kid’s favorite part of the day! Especially when we saw dolphins! 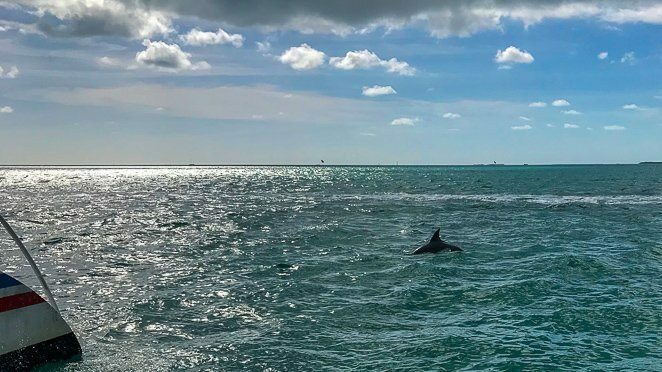 We spotted several dolphins excited to play in the jet ski’s wake. I think I was more excited than the kids, but man it was so cool to see dolphins swimming freely among us. Maybe that's because I'm a midwestern girl before began this full-time RV life. 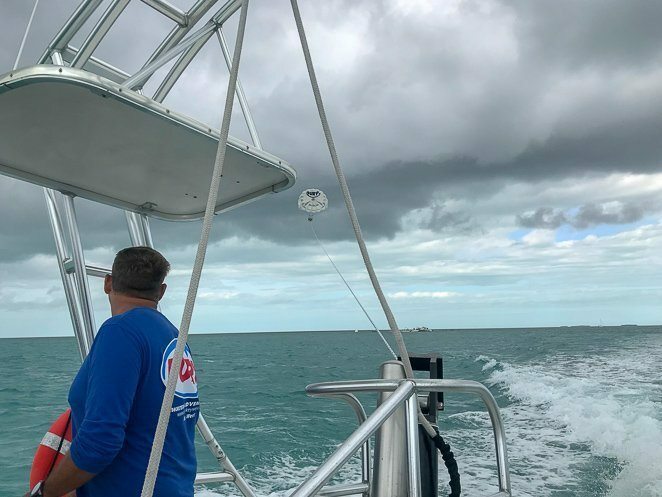 I was most excited to go parasailing during our Fury Key West adventure. It’s always been a dream of mine, one I’d say was on my bucket list since I was a kid. Once I got up in the air, it was thrilling and relaxing all at once. 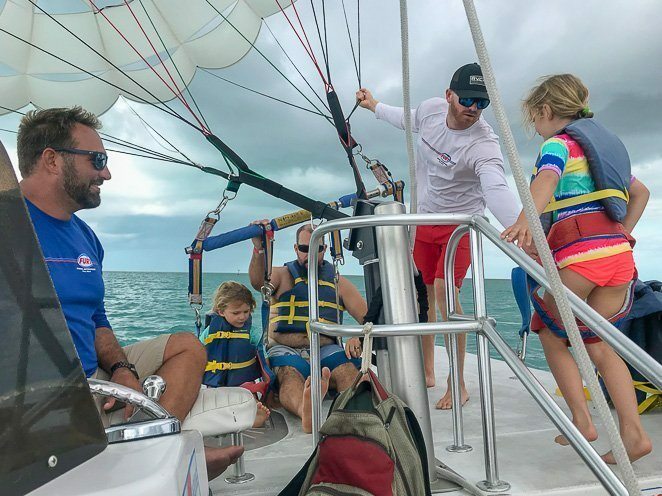 Our 3 ½ year old was too young for Parasailing, but our 6, 8, and 9 year old loved it! 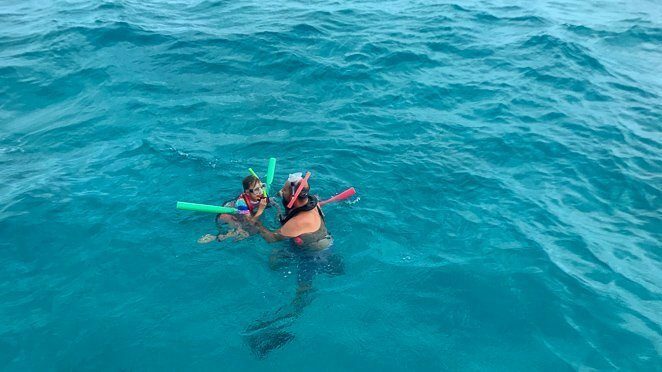 If your kids are old enough, plan to take one of the Key West Snorkeling trips. 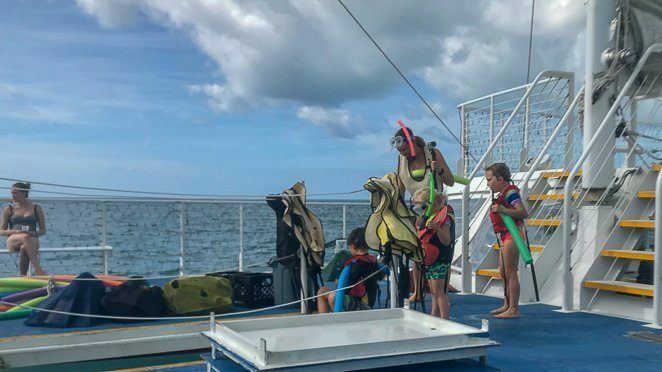 Our Ultimate Fury Adventures trip included snorkeling out at the Florida Reef. The kids were excited to give it a try, but the waves were pretty big that day and they weren’t that big of fans. However, Tony and I took a few minutes and went out to see some pretty cool creatures at the reef. 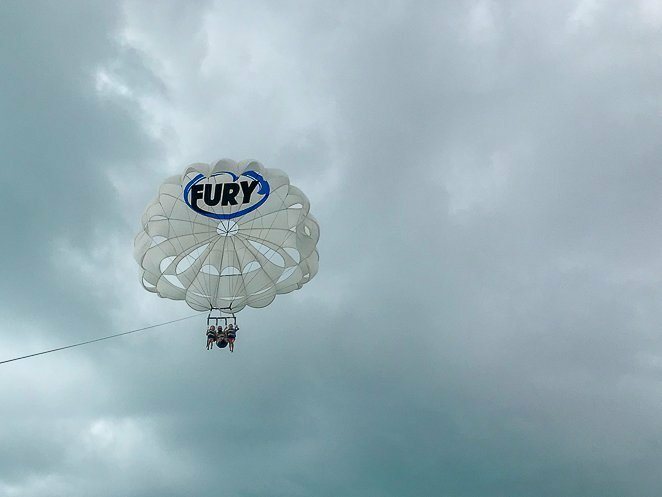 A special thank you to Fury Key West for sponsoring our Ultimate Adventure full-day excursion. Visiting Dry Tortogas National Park is on so many people's bucket lists! The hard part is, you can only arrive by boat as it’s almost 70 miles off shore. Some families will even put in for a camping pass and tent camp for a night. 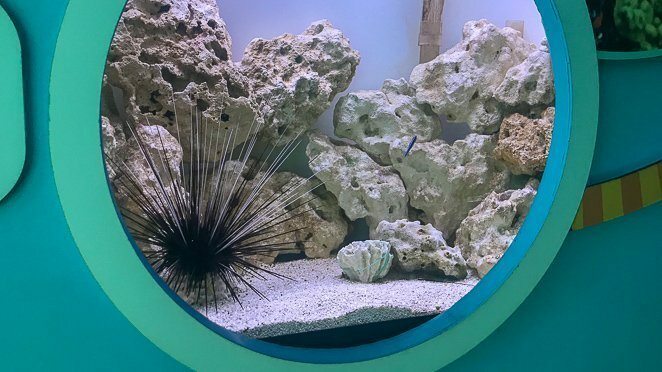 Visit the Key West Aquarium, right next to Mallory Square if you have a chance. You will see some small alligators, sea turtles, and have a chance to learn more about the sea creatures of the Keys. The Aquarium isn't that large, but there was a lot to see when we visited last year. 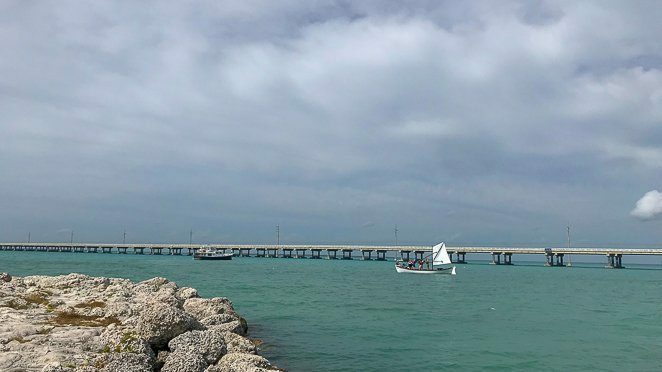 A great option for a family-friendly beach and fort on Key West is at Fort Zachary Taylor. You do need to pay per car to visit and park. I’ve heard great things about the Fort in addition to it’s beaches, yet our family never did make it in to visit. 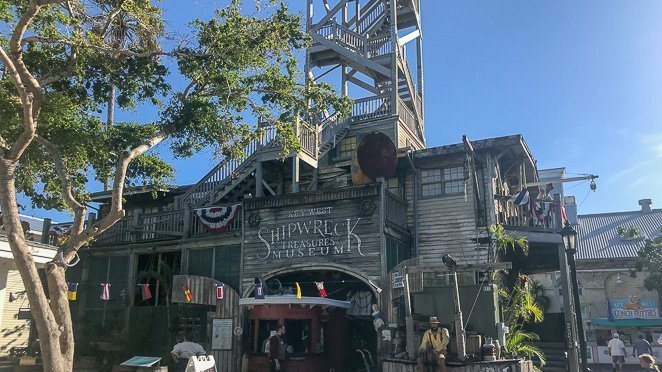 Near the Mallory shopping square and Aquarium is the Key West Shipwreck museum. It looks great for families and give you a chance to learn a little about the history of Key West. Grab a slice of pizza and some great Gelato at Duetto's. This small pizzeria had several food options allowing us to get a grilled panini for our dairy-free daughter while the rest of us shared a large pizza. 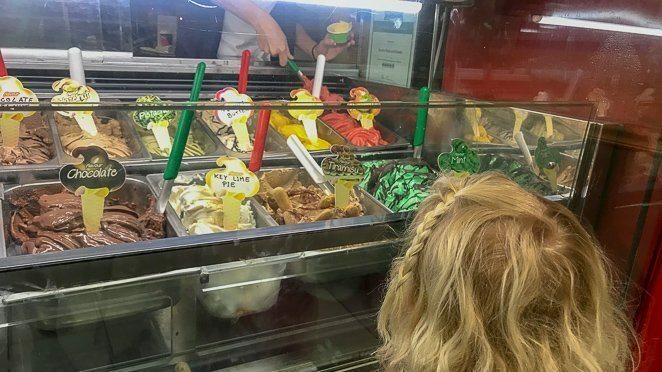 Then of course we had to treat the kids to gelato! If your kids are older, Ernest Hemmingway’s Home and Museum is a highly recommended stop. Ours are younger and we decided not to visit this time around as we didn’t want them to break anything precious in his home. 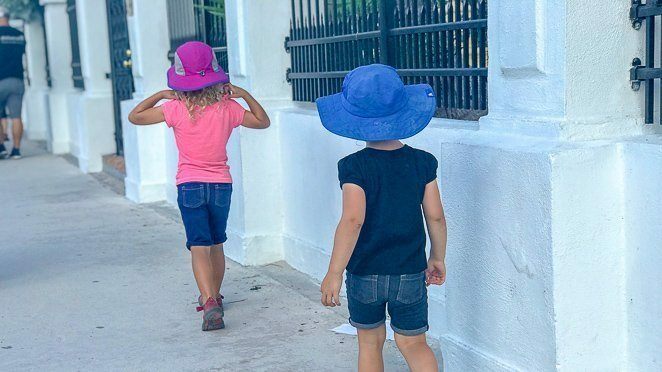 If you want to learn more about the history of Key West while visiting with your kids, then I highly recommend taking the conch Train tour. 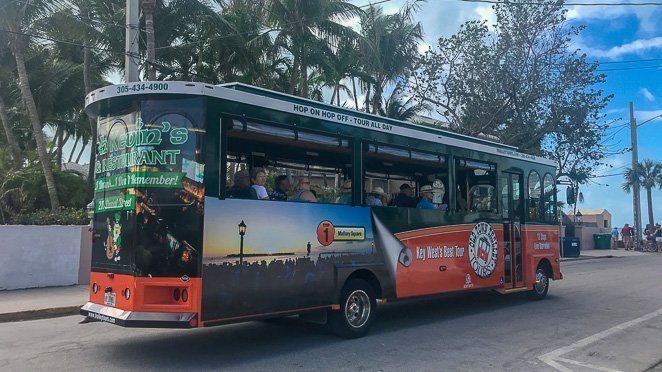 It’s a fun open-air trolley that takes you around the island while keeping everyone entertained and engrossed in the history of Key West. Our family enjoyed it last year when we visited and it gave us a chance to rest our legs and even have our 2-year-old at the time take a nap on my lap. 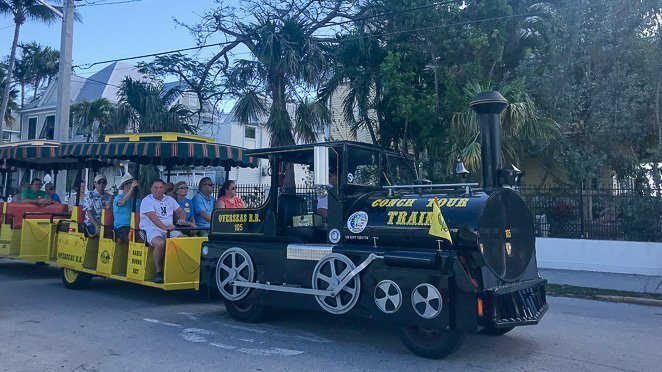 A second tour option is the Old Town Trolley tour of Key West. Our family never did take this Key West tour, but we enjoyed our experience in St. Augustine with Old Town Trolley. So if the Conch Train doesn’t work for you, grab tickets for the Old Town Trolley. If you have older kids, then they might be up for taking a tour of Harry S. Truman’s Little White House. We opted not to visit, as our kids were pretty young and we just didn't feel they have the attention span for it this year. Maybe next year! Finding great souvenirs, shirts and window shopping is another fun thing to do with kids. We liked walking up and down Duval street or the market near Mallory square. During our second trip to the Keys our kids were on a mission to find Christmas presents for each other, so we had a lot of shopping to do. The prices are fairly reasonable and there’s always something for the kids to look at in almost any store we visited. Just be sure to do this during the day, as Duval street is where the nightlife happens after hours and wouldn’t be the best place for kids at night. 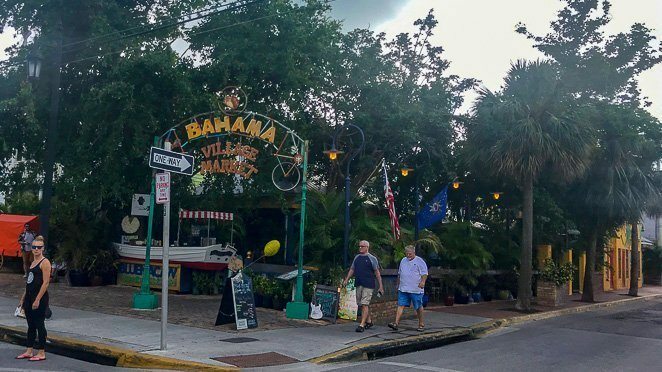 Another great shopping area in Key West is the Bahama Village Market. This is a fun place to walk around and find creative souvenirs and is a little less known than Duval Street. 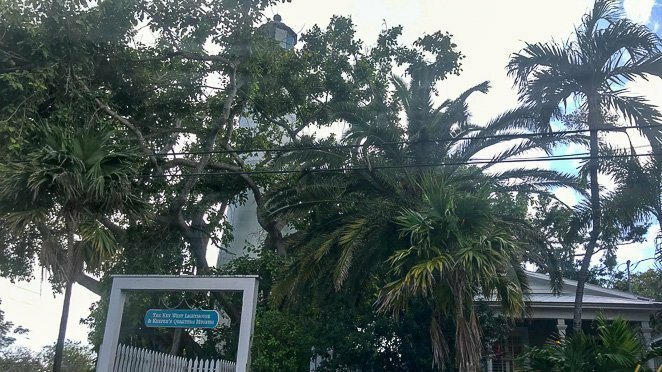 Depending on the age of your children, visiting the Lighthouse Museum might be a fun activity on Key West with kids. We never had the chance, but during our Conch train tour we learned a bit about it. 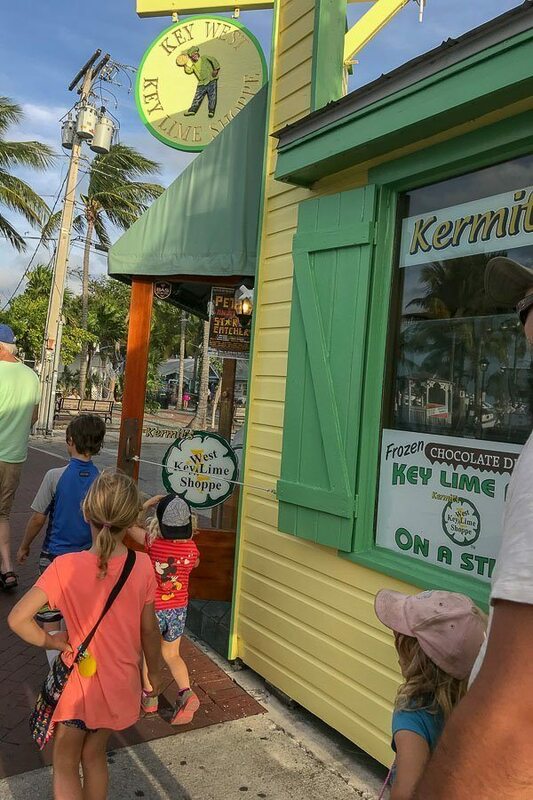 Indulge and grab some ice cream, a smoothie or special treat while visiting the Keys with your kids. Give in and have a little fun. We grabbed some ice cream during our train stop and started walking on foot to see more of Key West. I regret to say this was near the top of my list to visit, and we never did make it to the Key West Butterfly and Nature Conservatory. I think it was the Key West Garden Club that filled our interest enough to pass on it this year. I did learn from several other families that the butterfly garden is worth a visit though, so if you have time make a stop! This hidden gem is located between Higgs Beach and Rest Beach on the south side of Key West. The Key West Garden Club is run by donations and very welcoming to families. There were tables, bathrooms, and a water fountain inside the Garden that we used for an afternoon snack. We found free parking at Higgs beach and walked over to enjoy over an hour of walking around and seeing so many unique and tropic plants. 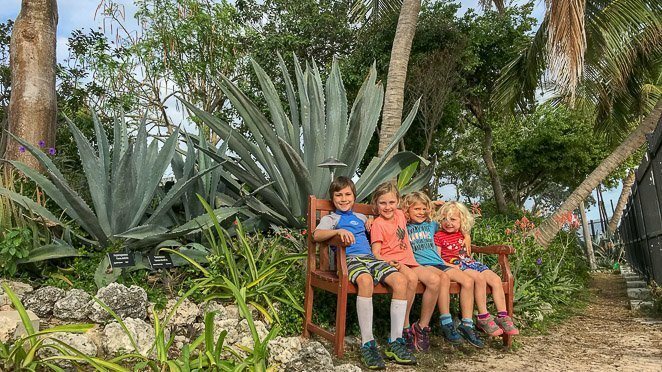 From giant cactus plants and banana trees to tropical flowers and a beautiful butterfly garden, we really felt like we found a hidden gem of a place. Oh, and it also overlooks the ocean too! If you arrive early to Mallory Square, enjoy a little window shopping. Almost every store we visited had a toys section for the kids and several inexpensive souvenirs for the kids to pick out. 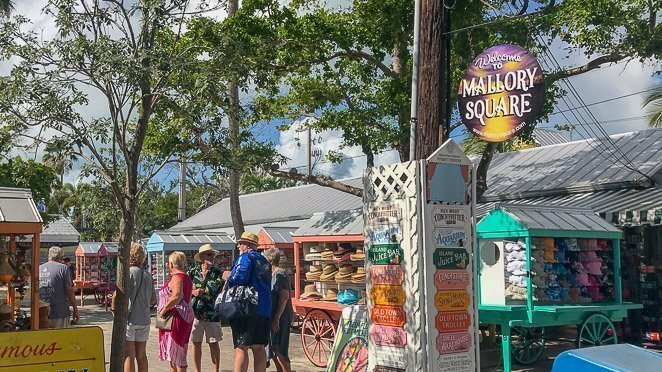 Mallory Square is located near the top, or Northern part, of Duval street in Key West. Every evening near sunset, it comes alive with street performers and a fun and exciting atmosphere. 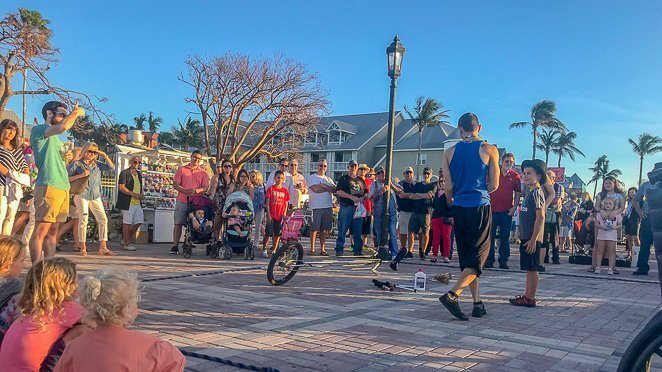 Every evening on Mallory Square, several street performers come out to give you a show, hoping for donations. Our oldest Riley was even asked to volunteer to help this man ride his unicycle while we all watched the sunset in the background. The Southernmost point is located at the end of Whitehead street and free to go and take some photos next to! Be prepared to arrive early in the day to find paid street parking, or plan to walk from the free Duval bus stop. It can always get a bit busy with tourists wanting to get their pictures taken here, so there is often a line of people. We arrived before 10am and only had to wait a few minutes. 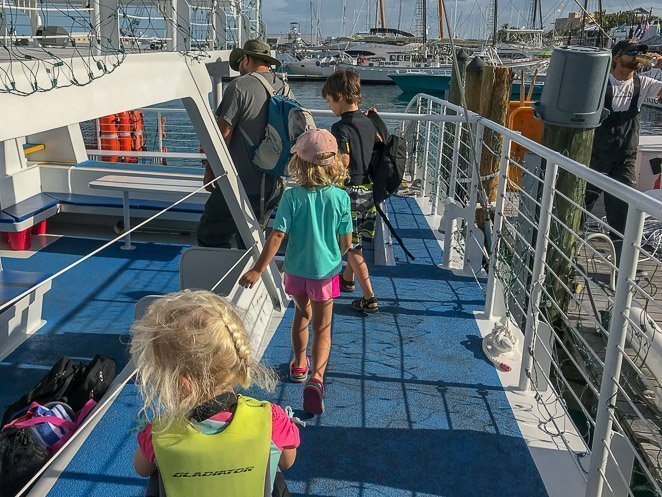 Looking for free things to do in Key West with kids? 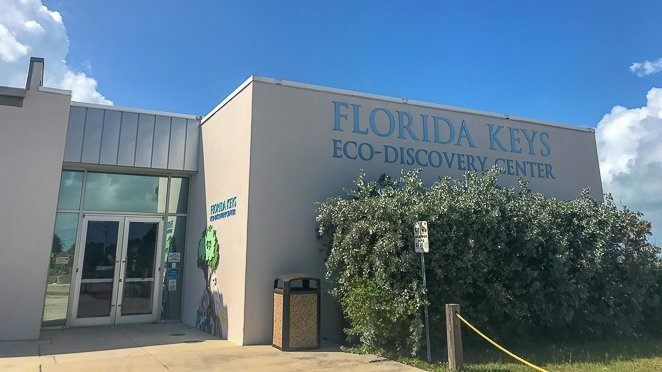 The Florida Keys Eco Discovery Center is completely free, along with free parking, and a great educational experience. It was also a great place to eat our packed lunch out back on their patio, then rest in the air conditioned center while the kids did their scavenger hunt. A great way to save some money and travel around Key West on a budget is to take the free Duval Bus. The Duval Loop runs from Mallory Square all the way down to the Southern most point. 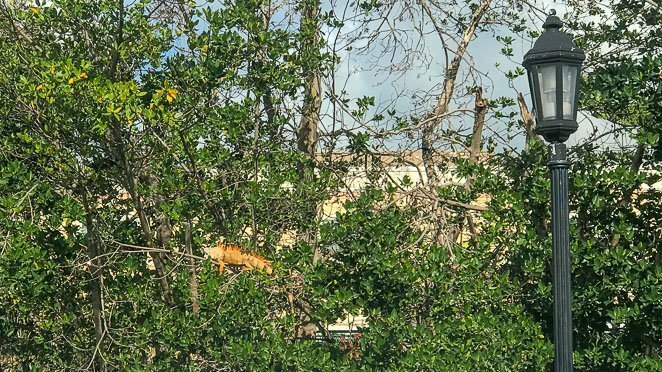 While riding the Conch Train, or just walking around the island, try to spot an Iguana in the Wild. Just stay back, I’ve heard they can be mean if you bother them. Bring your bikes, park the car, and then bike around the island. You’ll find that you are not alone. Many people that live in Key West bike daily since the island is small enough to get anywhere by bike. It could be a fun way to spend the day as a family touring the island. 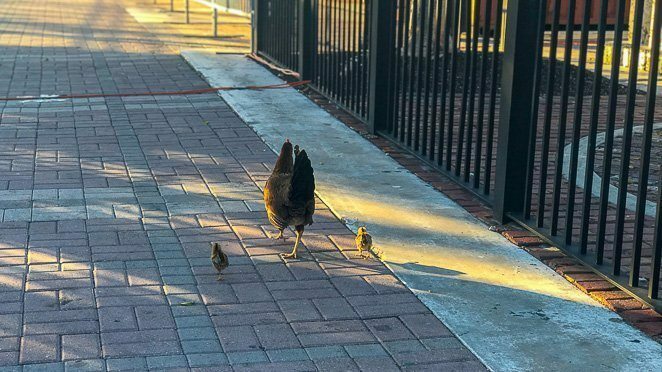 Make it a game to count how many wild roosters or chickens you can find while visiting Key West with your kids. They roam free around the island and you will even find them at the playgrounds! It's simple, but sometimes those simple things are the best experiences. 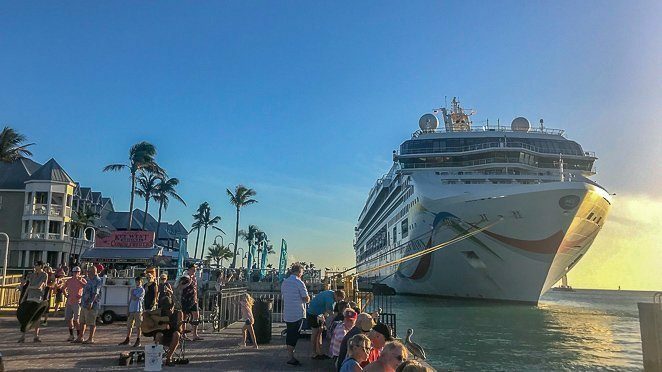 Our family really enjoyed being so close to a cruise ship right at Mallory Square. We haven't been on a cruise before, so getting up close to watch the sunset was pretty cool. Sometimes finding a great playground is all that's needed for a fun hour of time with kids on vacation. 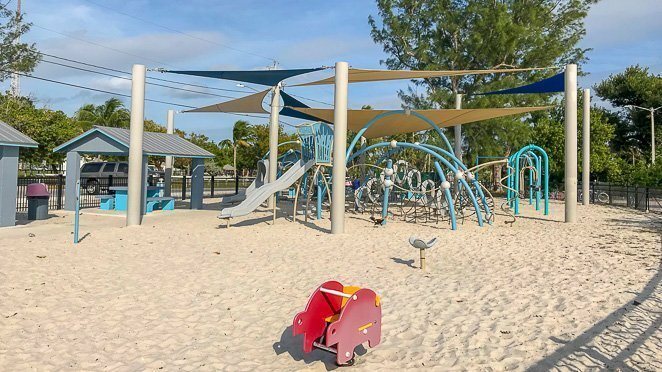 Higgs Beach playground was a great find for our family of 6 when we spent a full day in Key West. I appreciated the free parking, bathrooms, shaded picnic tables, and a fenced in really cool playground. However, Higgs Beach itself was not my favorite beach to spend the day at. 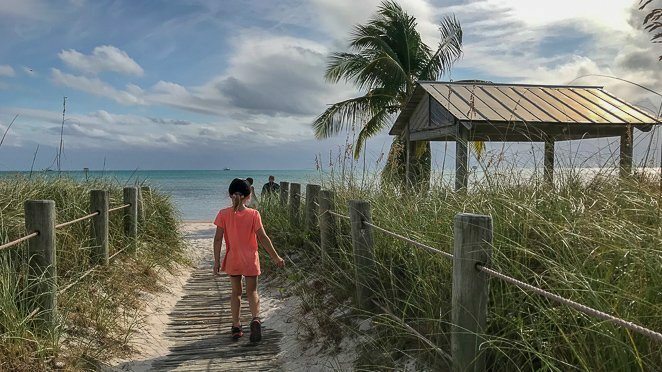 There are much better beaches in Key West for families. 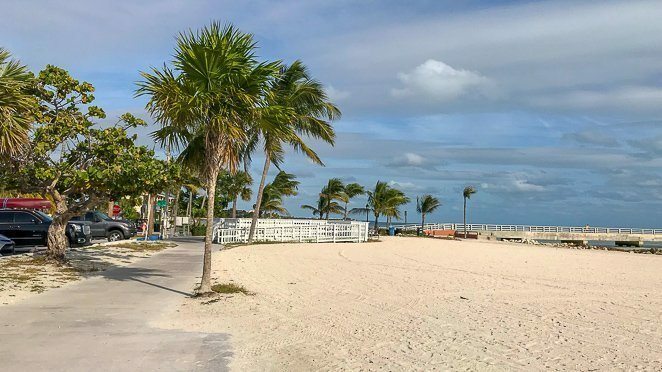 Our top pick for the best beach in the Florida Keys is Smather’s Beach. 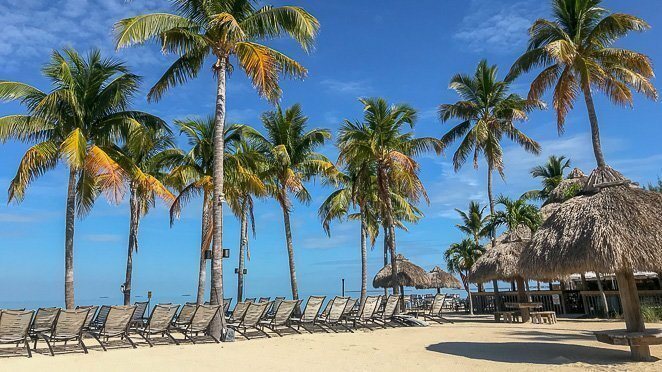 You can read more about our review of beaches in the Florida Keys here. 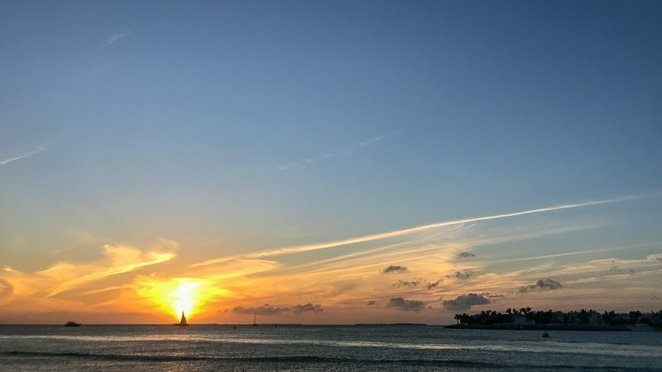 Smather’s has very soft sand, is a larger beach than other options, offers a large amount of free street parking, has bathrooms and has a nice beach line. South beach is a small beach only blocks from the Southern most point. The sand was soft and the kids really liked putting their feet in for a bit. It was a free beach in front of a restaurant providing chair rentals. 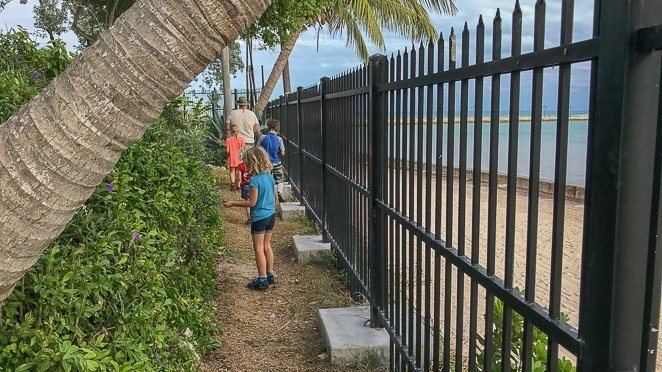 If you are near Higgs beach playground, then walk beyond the Key West Garden Club to find Rest Beach on the other side. This quiet beach is clean with free parking out front and a family-friendly vibe. 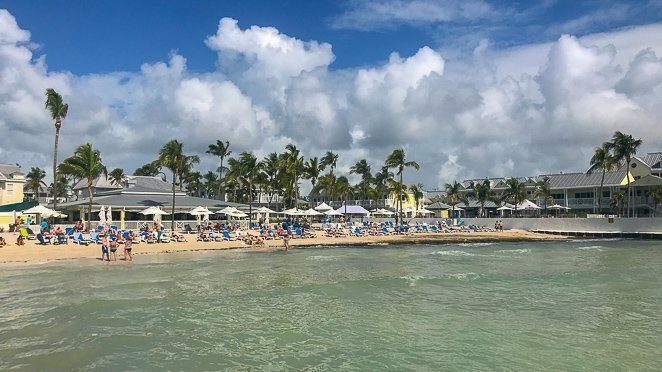 Take it easy, relax, and enjoy the laid-back feel of Key West. Choose a few things that everyone in the family wants to do, and then spread it out during your vacation. 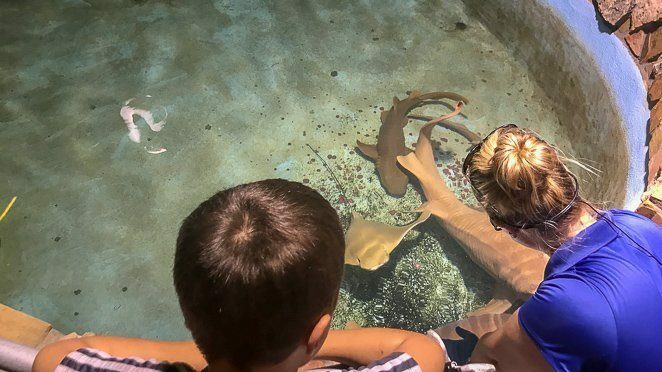 If you have time and a car, take a day trip to visit a few other Keys such as Bahia Honda or Marathon and check out other fun things to do in the Florida Keys with kids. If you have fair skinned children, be sure to bring sun hats. You'll thank me later when they don't have red noses from the intense Florida sunshine. How will you get to Key West? Well there are several options. Drive the 3 ½ hour Overseas Highway from Miami down to Key West is what many people do. You could fly into the Miami international airport and rent a car. Then make it a fun road trip. Or, if you're like our family, you could be driving your motorhome and just drive right down Highway 1. You can also fly into the Key West International Airport. It’s a small airport that has regular service to and from Miami and a few other airports. Many visitors will end up flying into Miami and driving down to Key West though. There are several options when it comes to getting around Key West. It really depends on how you arrived on the island. Driving is totally doable, just be prepared to pay for parking on much of the island. Biking is another great option as the island is only 8 square miles. Or, you can use the bus system and even catch the FREE Duval bus loop! You can find free parking on some streets on the South side of the Island near the Airport, Smather’s beach, and Higg’s beach. Parking anywhere else on the island will usually require you to pay with quarters or cash. There is also the Old Town Garage that is a municipal parking garage that charges $4 per hour or $32 per day. Another option is to drive around looking for a paid parking lot. We ended up paying $20 for a full day of parking just 2 blocks away from boarding the boat for our full day with Fury Key West. 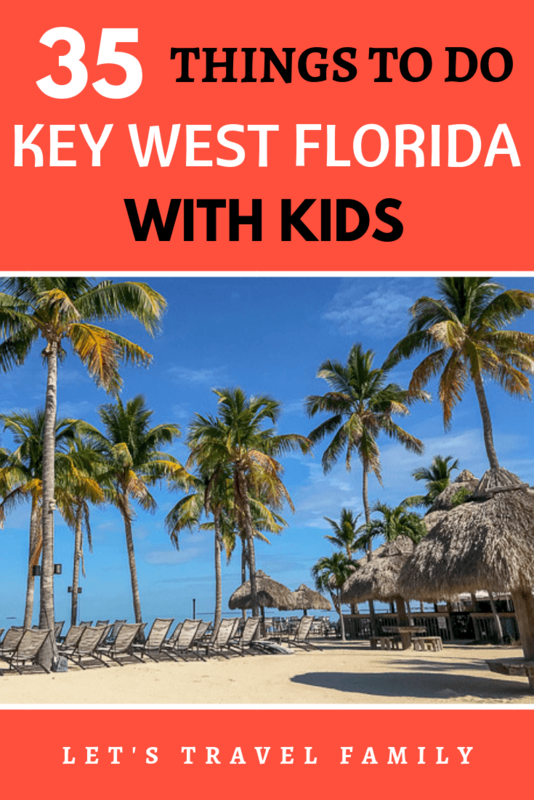 Click here to see the best Key West hotels for families. 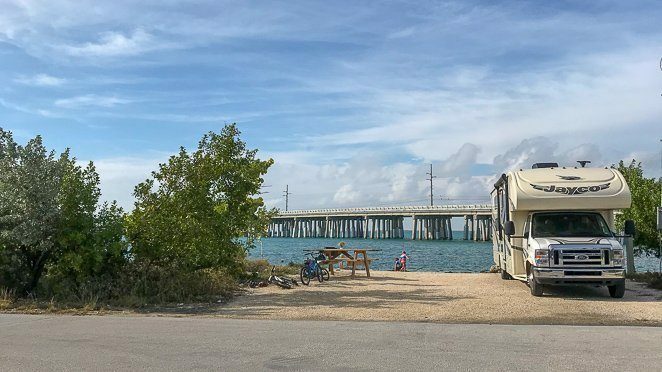 Or, if you're hoping to find some campgrounds nearby to park your RV, as we did, then I highly recommend looking into the Florida State Parks in the Keys. Bahia Honda State Park has a fantastic campground, however it books up very early so be sure to plan ahead. 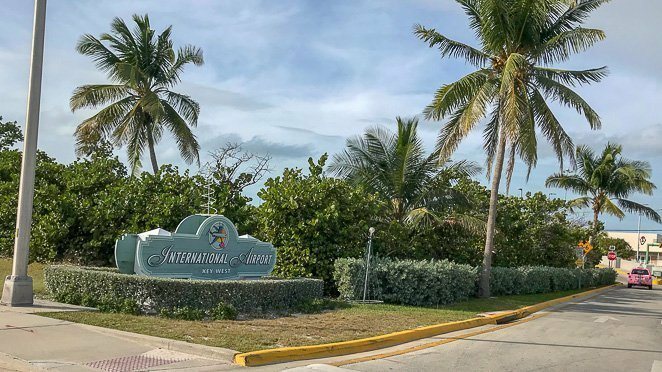 Sunshine Key RV Resort is only a 35 minute drive from Key West that offers full hook-ups for RVs and has great reviews. Or, if you are willing to drive a bit then Fiesta Key RV Resort is located near Islamorada in the Keys. 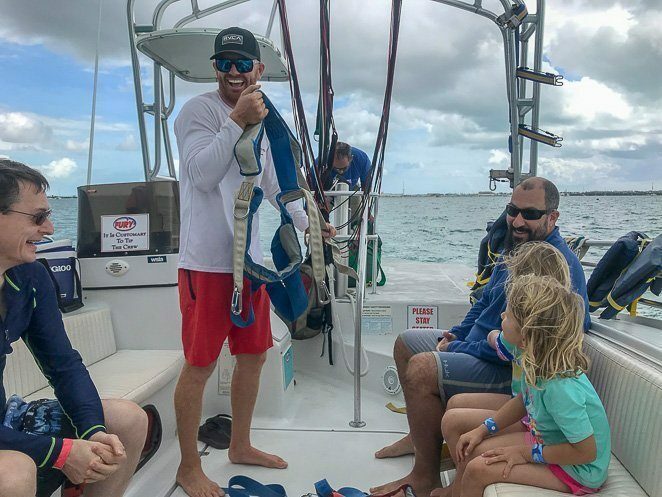 We really enjoyed our stay at Fiesta Key and I've talked to many families that make a day trip from Fiesta Key to Key West for a visit. Soak in the sun, enjoy your time together, and make some amazing memories. 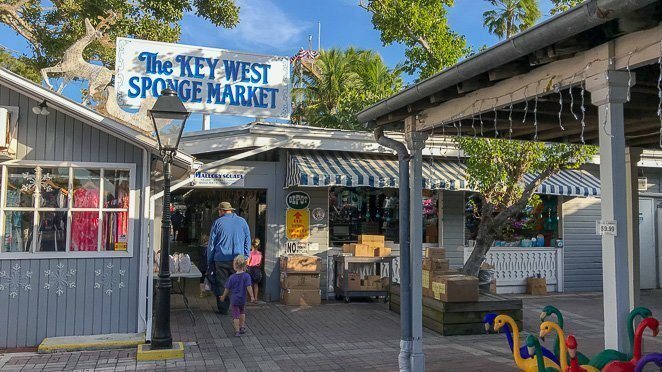 Key West is one of our family's favorite destinations, along with other areas in the Florida Keys and the West Coast of Florida.